This is the early cover image release for what will be one of the most eagerly anticipated books of 2009. Gretzky's Tears: Hockey, Canada, and the Day Everything Changed is written by Stephen Brunt, the fine Globe & Mail columnist and author of the critically acclaimed 2007 release Searching for Bobby Orr. Brunt dissects the continuing aftermath of the biggest trade in NHL history, looking at the many angles the world of hockey changed after Wayne Gretzky was sold from Edmonton to Los Angeles. Interestingly, the book will be sold in the United States with the title Gretzky's Tears: Hockey, America and the Day Everything Changed. Mr. Brunt tells me the two books are basically the same texts, with the American version slightly altered to clarify Canadian cultural differences. 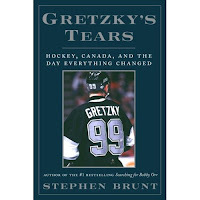 By the way, Mr. Brunt's book will not be the only book looking at the Gretzky Trade. 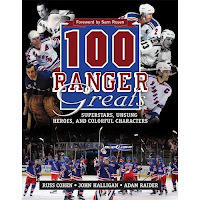 In fact, there is another book coming that is written by the man who traded Gretzky, Peter Pocklington himself. 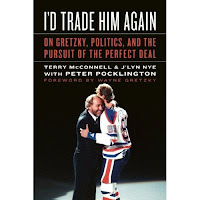 I'd Trade Him Again: Peter Pocklington on Gretzky, Politics and the Pursuit of the Perfect Deal is slated for a mid-October release. With the 2010 Olympics coming to Canada in February 2010, you can be international hockey books will dominate the 2009-10 hockey season. The World of Canadian Olympic Hockey looks to be especially promising. 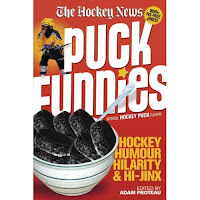 In addition to being released by Hockey Canada and the Hockey Hall of Fame, it is authored by Andrew Podnieks. Podnieks wrote the long-since-discontinued Canada’s Olympic Hockey Teams: The Complete History 1920-1998 back in 1997. Largely factual, it is one of my favorite Olympic titles. Could this be the long awaited update? 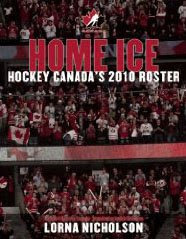 Hockey Canada also is behind the release Team Canada 2010: An Official Hockey Canada Guide. 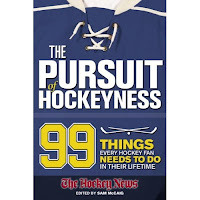 This book is authored by Lorna Schultz Nicholson, the wife of Hockey Canada boss Bob Nicholson and a very accomplished writer. This title is currently slated for a mid-December release. 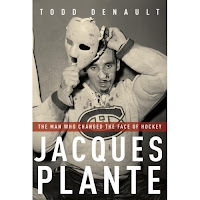 Jacques Plante: The Man Who Changed the Face of Hockey - Todd Denault's first release promises to be a big hit. While we currently debate who's better, Brodeur or Roy, Denault will take a convincing look at the goaltender who I think may still out rank today's stars. 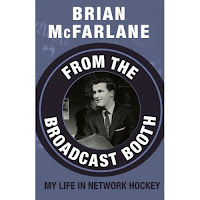 From the Broadcast Booth: A Career in the World of Network Hockey - Brian McFarlane has put out more hockey books than anybody, and a lot of his stuff is regurgitated. But I'm really looking forward to this one. His best book, in my opinion, was 2001's Brian McFarlane's World of Hockey. He was open and a great story teller in the surprisingly entertaining book. I'm hoping for more of that in his October 2009 release. Perhaps similarly, TSN's Hockey Insider Bob McKenzie releases his first book, Hockey Dad: True Confessions From a (Crazy) Hockey Parent, as early as late August 2009. His oldest son is now playing in US college while his other son was forced out of the game at age 14 due to concussions. McKenzie is a TV and print personality, but he is said to be open and candid in this highly personal look at the good and the bad of hockey. 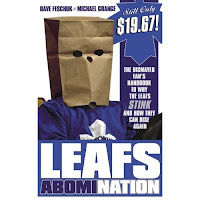 Leafs AbomiNation: The dismayed fans' handbook to why the Leafs stink and how they can rise again - Dave Feschuk and Michael Grange have an interesting book coming. It looks like it could almost be comical - the listed price: $19.67. The Good, the Bad, and the Ugly Detroit Red Wings: Heart Pounding, Jaw Dropping, and Gut Wrenching Moments from Detroit Red Wings History - This book may have the longest title of 2009. This is a continuing series from last year, with the Rangers and Flyers getting similar looks. The Making of Slap Shot: Capturing the Spirit of the Thing - The infatuation with this cult-classic motion picture only seems to grow over time. 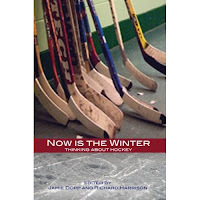 Now is the Winter: Thinking about Hockey - This book is penned by Jamie Dopp and Richard Harrison, and is listed as a June 2009 release. To be honest, I'm not sure what exactly this book will offer as of this time. Both Dopp and Harrison are poets and literature educators at Canadian universities, leading me to assume this book will be quite different than the stereotypical hockey book.